This is a bittersweet review for a tea I truly enjoy, but one that now needs to be an occasional sip. I usually shy away from flavored teas, but this blend from Harney & Sons captured my affections. It's perfect for the winter weather. It warms the palate and body. I don't usually like sweet teas, but the cinnamon is so strong it overpowers the sweetness. I first had this tea as a sample at the New York Coffee & Tea Festival, so I didn't know what the ingredients were. I loved the flavor so much, my friend who tried it with me recently gave me a beautiful tin of the tea bags. I was delighted with the gift, but after inspecting the ingredients listed on the tin, I was disappointed to see that there are artificial flavors in this tea. I rarely buy products with artificial flavors or colors in them, especially in things I consume on a daily basis. So as much as I love this tea, it went from being a regular indulgence to one that is just occasional. 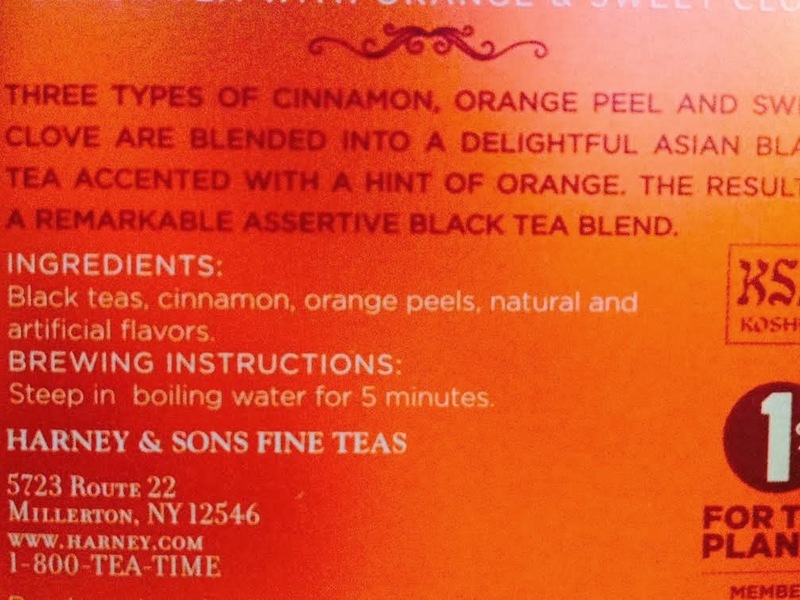 I respect the Harney & Sons company, and I was surprised to see they add artificial flavors to their teas. Since I don't usually drink flavored blends, I haven't noticed this on any of their other teas. I will be carefully reading labels in the future. This tea is known as one of their most popular flavored teas. I can understand why- the play of spicy and sweet is just right, and hints of orange and clove are perfect for chilly weather. The spices linger on the tongue long after the tea has been sipped. Now I know this is because of the artificial additives, and not just the natural spices. The sweetness should have given it away, but I was too taken when the spiciness to notice. As much as I love the taste of this tea, it is now in the same category as bubble teas- something I have when I'm in the mood for a sweet drink. This can be my winter alternative to bubble tea. The attractive tin will also brighten up my office. If you enjoy spicy blends and don't mind artificial flavors, definitely give this tea a try. Interesting. I should check my oolong and green tea to see if they have artificial additives as well. I'm usually too busy checking to see the caffeine levels. I don't think the pure teas do, but maybe check if you have any flavored blends. Do you know what the sweetener is? Unfortunately, I don't. In the ingredients it just says black teas, orange peel, 'natural and artificial flavors'. so they don't disclose what the sweetener is. I could try and inquire, never hurts to ask! They say on the Amazon page that it is sweetened only with cloves. No sugar added. Thanks for the comment! As you can see from my canister above, it has artificial flavor. Perhaps they've recently changed the formulation? I'll have to investigate further. Thanks for letting me know! After reading a piece earlier today stating that HFCS is now sometimes labeled as "natural sweetener" (http://yournewswire.com/high-fructose-corn-syrup-renamed/)I once again became worried about this tea. When I first drank it, I wondered about the sweetness, but saw (as one commenter above mentioned) that the company has implied that the sweetness is from cloves, even though the ingredients listing clearly states "natural and artificial flavors". I've emailed the company's customer service folks asking for clarification about what exactly that means. If I get a response, I'll pop back over and share it here. Emilie, thank you! It is definitely too sweet for the flavor to come just from the cloves. Definitely let us know what you find out! Wow great detective work Emilie! Yes I am sure that's what is going on with this tea. I hear ya, I still have my tin of this tea, I can't get myself to drink it more than on rare occasion. Argh this is so upsetting. This is my absolute favorite tea ever. Go figure it has an artificial sweetener. I pride myself for staying away from all things artificial and never imagined I would be led astray by a tea bag. Who would have thought I should have read the label. Just bought the mega bag on Amazon, too. "/ I had a feeling, though, that's why I searched & found this blog. Grateful for it. Thank you. Sorry to bring the bad news to you, Dre! But glad you know now. Will you still drink it? I know it's frustrating, since it is so tasty. Thank you for your comment. I'll have to check out the one from Chicago Roastery. Wow you get to go straight to Mr. Harney himself! Do keep me posted, this is quite an adventure! Way to go! "Thanks for the note. We do share your concern for transparency & added sweeteners. However I disagree that anything that is added to our Hot Cinnamon is a sweetener. Phenylalanine is an amino acid. The cinnamon tree makes it for various uses. In the presence of certain enzymes, that amino acid is modified by the plant. After several steps (including becoming cinnamic acid) it might become cinnamic aldehyde. The plant biosyntheses (naturally makes) this chemical for various purposes including lignin used for structural purposes such as bark. Humans have found that that if cinnamon bark is dried, it tastes sweet. That means that this chemical excites certain taste receptors on your tongue that send signals to your brain: sweet. Does that make the chemical a sweetener? No. The FDA does not consider it a sweetener, rather it is considered a GRAS (Generally Regarded As Safe ) flavor. As mentioned this chemical is found in bark, there are other substances found in bark that give the natural chemical an woody flavor, as well as other flavors. Thus we use a purified artificial version. Since there is no bark flavors, it seems sweeter and spicier. Phenylalanine is combined aspartic acid and methanol to make Aspartame. Aspartame has to be manufactured under control conditions that included fermentation and changes in temperature. That does not occur with our tea. So there is no version Aspartame in our tea. I can understand that all of this does get complicated. However what we use is a flavor not a sweetener as defined by the FDA. I am happy to discuss this further with you. Sara, I would love your thoughts on this. Since it is not combined with aspartic acid and methanol to make aspartame, do we still think it is as harmful? oh my! It's hard to argue if it's chemistry, but so much of what he says seems creepy to me. What does a 'purified artificial version' mean? And just because something is 'generally regarded' as safe, it doesn't make me feel good about it. Unless he can pull out scientific studies showing that their version isn't as harmful as aspartame, I will continue to be wary of it. It's not natural. I do think he is trying to show that they have good intentions with their tea, but when it comes down to it, it still contains artificial flavors. That's really not something I want when I look for tea. It is about half of the active ingredients in oil of cinnamon. Both it and the other active ingredient of oil of cinnamon, cinnomaldehyde, are chemically created -- in nature -- from phenylalanine -- the boogy man mentioned in the www.thefoodcoach as a precursor to aspartame. The phrase in the www.thefoodcoach.com.au article is lifted from the Wikipedia article on cinnamic acid. Note that the difference between the two chemicals is one oxygen atom. Note that these are completely natural chemicals -- any artifice involves distilling them from the original cinnamon bark. Thanks Heather! It is definitely confusing to read. Still, the label says artificial flavor, so it's something I drink in moderation for sure. Labels can be so misleading! Thank you very much, Dre, for posting Mr Harney's reply. As I understand it, phenylalanine is an amino acid that the cinnamon tree naturally metabolizes into cinnamic acid and, later, cinnamic aldehyde. The tree then uses this cinnamic aldehyde to produce the lignins it uses to form its plant structures, including the bark. The bark is the part we humans use to make cinnamon tea, because we find that, when we dry the bark, this chemical (cinnamic aldehyde) in it makes it taste sweet (i.e., the cinnamic aldehyde in the dried bark activates the sweet receptors on our tongues, which our brains then interpret as a "sweet" taste). However, because this "sweet-tasting" cinnamic aldehyde found naturally in the bark is accompanied by other woody-tasting chemicals, Harney & Sons has decided to use this sweet-tasting chemical in a purified form by removing the woody-tasting chemicals it's normally found with. It's this purified form of cinnamic aldehyde (i.e., separated from the other woody-testing chemicals that normally accompany it in the bark) that they use in the tea, and because it's a purified form, it tastes sweeter than it normally would when accompanied by the other woody-tasting chemicals found with it in its naturally occurring form in cinnamon tree bark. Now, because it's only purified (i.e., separated from those other accompanying woody-tasting testing chemicals), and not manufactured (like aspartame is), it is not - nor should be - considered a sweetener, hence the FDA's classification of it as a non-sweetener. 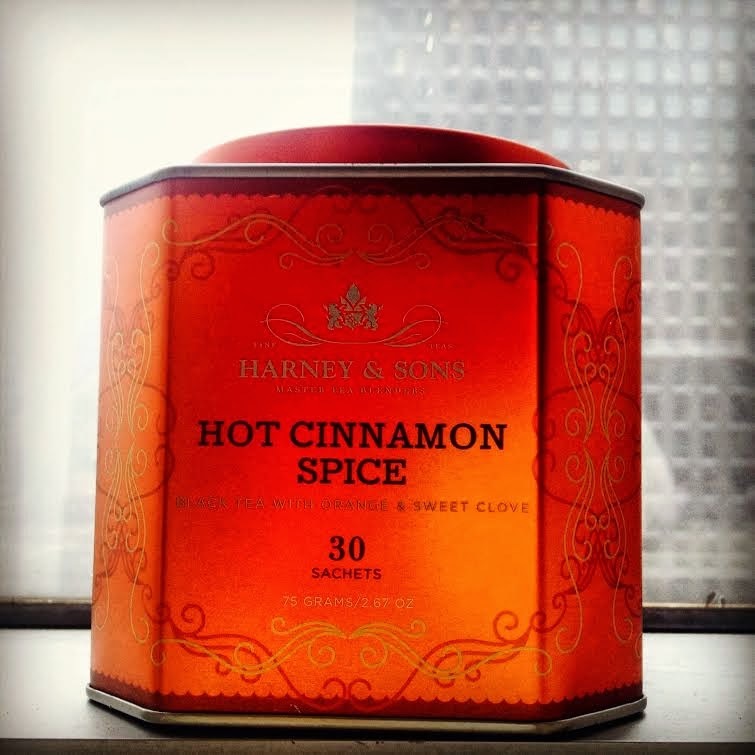 In my view, what's unclear is whether Harney & Sons is only purifying this naturally occurring, sweet-tasting cinnamic aldehyde or artificially synthesizing it in a lab and then adding it to the tea so that the tea contains more of this sweet-tasting chemical - and in a purer form - than the cinnamon tree bark would normally contain. Because the chemical is a naturally occurring ingredient in common tree bark, the only thing unnatural about it is the process by which it's purified: a) by extracting cinnamic aldehyde from the tree bark and then purifying it or b) by synthesizing the cinnamic aldehyde artificially in a lab and then adding it to the tea to enhance or increase its natural sweetness. This latter method send more efficient for larger-scale production in the food industry (similar to the way we produce vitamins), and may account for why it must be labeled as an artificial flavor in the list of ingredients. Unless I misunderstood something important, perhaps we can ask THAT question (i.e., how the cinnamic aldehyde is purified) of Mr Harney in order to get a clearer answer? The chemical cinnomaldehyde also occurs in the leaves of the cinnamon tree. Cinnamon oil (which contains both cinnomic acid and cinnomaldehyde) is steam-distilled both from the bark of the tree or from the leaves. The leaf method is bio-sustainable. Some cinnamons are from varieties of trees known as cassia -- these contain larger amounts of a chemical known as coumarin, which, if eaten in excess, can cause liver damage. So, extracting these two flavoring chemicals from the oil of cinnamon leaves behind the coumarin, and removes the possibility of liver damage. It should be noted that cassia cinnamon is the stuff you normally find in the market. The other specie of cinnamon tree is known as Ceylon, and it is very expensive relative to cassia -- which is what "Saigon cinnamon", for example, is. I too fell in love with this tea but eventually became skeptical of its excessively sweet flavor, so I looked up the nutrition info to see if there actually was sugar in it. I found the only fishy thing to be the natural and artificial flavoring. Fishy because on the website I went to it wouldn't tell me what those flavors actually are. Upon scrolling some more, it said the tea contains a controversial ingredient. But again, it wouldn't tell me what that ingredient is. I decided I needed to know because I don't want to be oblivious to what's in the food and drink I consume, but especially since I drink this tea so often. Then I found your article then that article posted in the comments. It must be cinnamic extract or something similar. I have a sweet tooth and thought this tea was the solution to my problem of drinking too many sugary drinks. Sadly, I was deceived. I guess I don't have to give it up completely but I'm kind of bummed that it has to be an occasional thing now. On the bright side, Harney and Son's ginger tea is my second favorite of their teas, and it definitely doesn't have artificial sweetener in it. In my case, spiciness compensates for lack or absence of sweetness. Hi Meg, Thanks for leaving your comment! I'm so glad you found this post helpful. I'm amazed at how much info we've been able to find out about the ingredients. I love ginger tea, so I'll have to check out H&S's version. Thanks again!